Today I was pretty unsure what I’d write about, I’ve had a bad case of procrastinitus. I don’t know why, but today I’ve just not really felt like doing a whole lot. So in an effort to try to break the feeling I decided to have a look in my folder of _really_ old PC games. I found something interesting that I hadn’t played before. 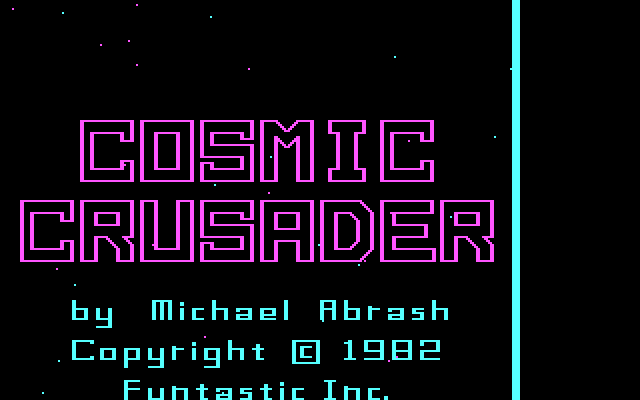 I found a game called Cosmic Crusader written in 1982 by Michael Abrash for Funtastic. Michael Abrash is of course better known for his later work, his technical writing and working on Doom and Quake. I’ve read a good portion of his black book on graphics programming and found it quite the interesting read. 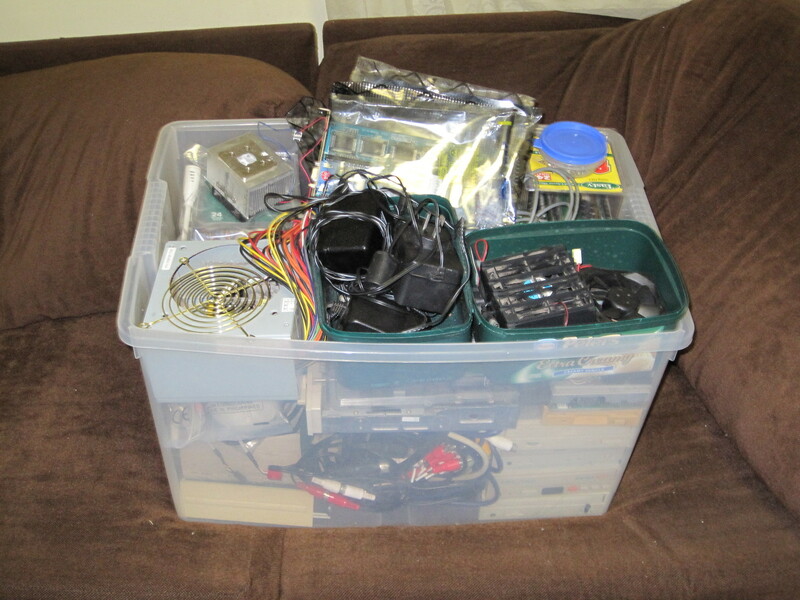 I’m still part way through reading about the VGA and getting the most out of it. Now that I’ve been thoroughly distracted lets return to the game itself. It supports CGA and PC speaker sound, which is unsurprising as there was little else. The graphics are well drawn but the speed of the graphics is perhaps the most impressive feature. There are many moving objects on screen, and they manage to do so at a reasonable pace. Something that wasn’t easy on the original PC. The only flaw I noticed is some flicker when sprites overlap, perhaps unavoidably. Sound is as you’d expect, your usual assortment of noises that is pretty good given the hardware. You can of course turn them off if you find them annoying. The game is very much like Galaxian, but of course on a reduced scale. There are some extra elements that make it different to the original game. Firstly you have a shield to protect yourself, you engage it by pressing the space bar and it lasts a fixed period. Whilst your shield is up anything that collides with you is destroyed. However you only get a limited number of shields, but you can increase this by shooting a power-up that travels across the screen. 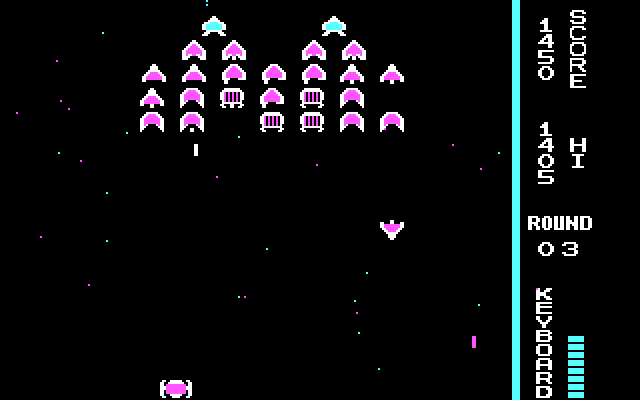 Sometimes a large mothership descends to join the enemies at the top of the screen. It shoots a large and fast projectiles that are quite dangerous, combined with the diving enemies it can be difficult to dodge everything, a good time to use a shield. The only thing I found that let the game down was the controls are a bit fiddly. You press a button to move either left or right and you will keep moving until you either press the other direction or a stop key. This resulted in me zig-zagging a little bit as I got used to it, which sometimes got me hit and sometimes helped me dodge, so it all evens out. The game is CPU dependant for speed so the best way to play it now is via Dosbox. I use a setting of 250 cycles normally to be roughly the same speed as the original PC, but this game is quite playable at 350 cycles. 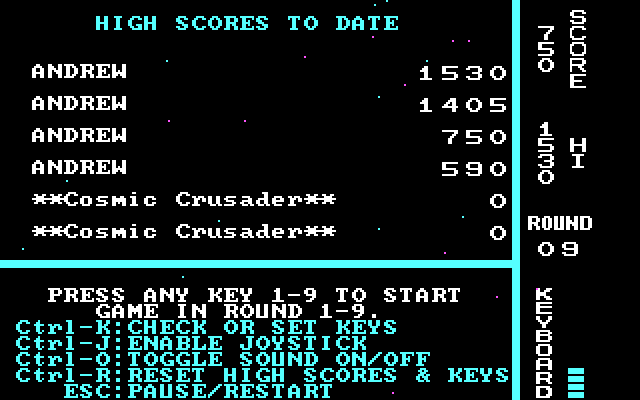 I had fun with Cosmic Crusader, it is enjoyable as a new experience even today. It seems to have at least cured my procratinitus, at least temporarily. 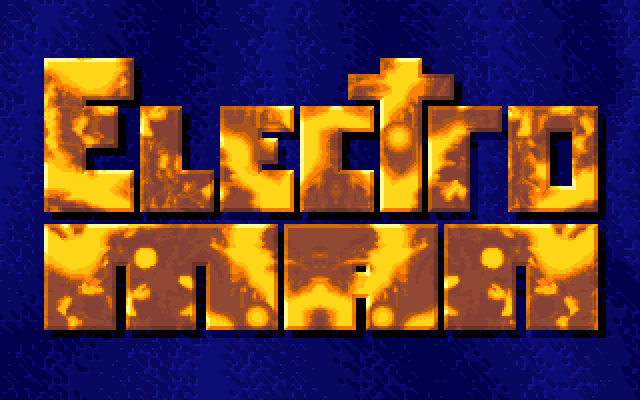 Electro Man was created by a small company called xLand and published by Epic Mega Games in 1993. It is a puzzle platform game with a few action elements. The story is simple, your name is Jacek who has been modified with robotic components until he looks like Robocop. 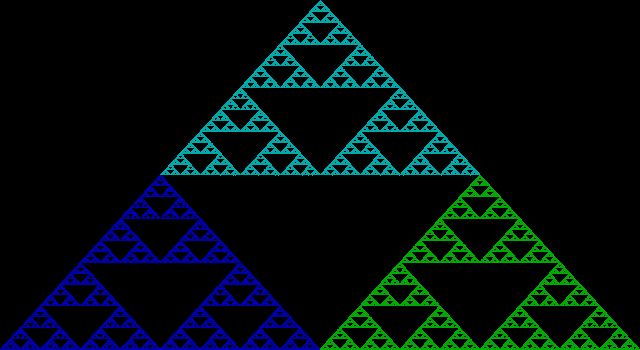 Your goal is to find three computer chips within each level and to fight off the robots that inhabit the space. You have a gun you can use to destroy enemies, but you need energy in order to power it. You can find energy around the level in the form of batteries, as you fire the gun you eventually use up the energy. Today I played the Creative Commons version of the game released in 2006. It was compiled from the original source by Maciej Miasik who is one of the original authors. It hasn’t been tested on any real hardware and was built specifically with Dosbox in mind. 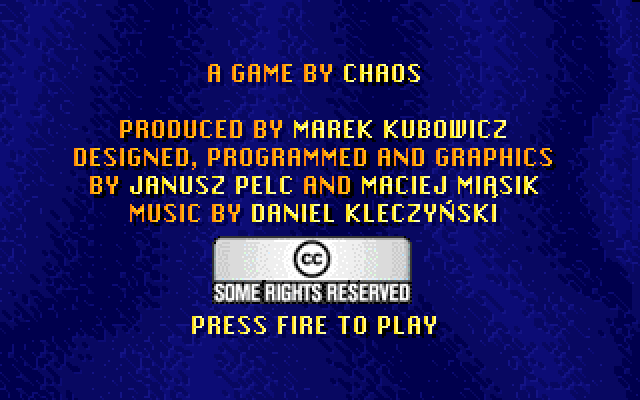 This has to be one of the first games re-released specifically for Dosbox. It supports VGA and a range of different sound devices. 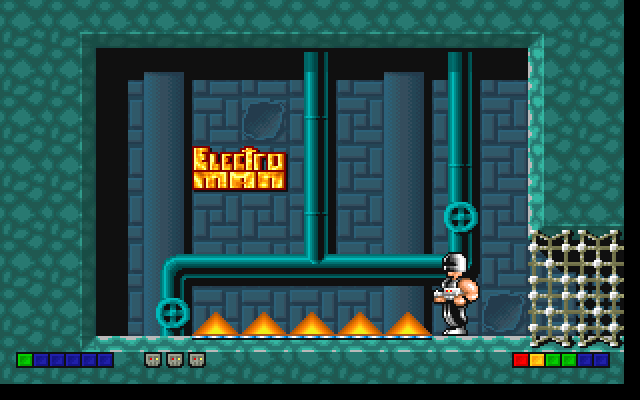 The original game before Epic published it was called Electro Body instead and had support for EGA and CGA graphics modes and the PC speaker. They published the game a company called CDV for a while until they caught the attention of Epic Mega games, who published the game under the new name. They later published a pack of puzzle games, all from xland, including Heart Light, Adventures of Robbo and of course Electro Man. The version of the game I have supports only VGA graphics, and like Heart Light offers monochrome VGA in addition to colour. I thought the graphics are very well done. 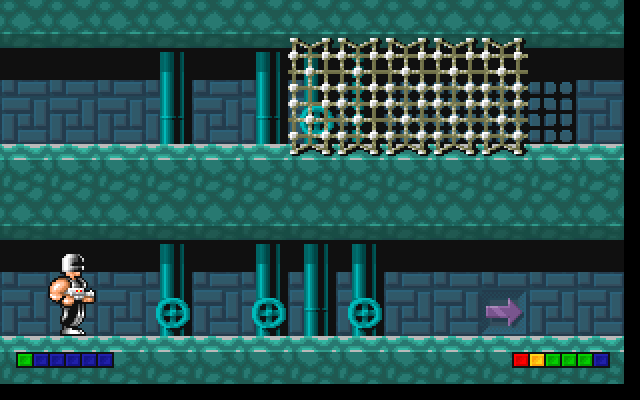 Levels and sprites are quite nicely drawn with plenty of detail and texture in a style similar to other platform games. The animations are quite smooth with a higher frame count and frame rate than I’ve seen in some games. I played the game using the Sound Blaster support the game has. Sound effects in general suite the game, although some of the effects are a little long and contain speech. Fortunately because the game is not fast-paced, you won’t get overloaded by sound, and the more common sounds like shooting and explosions are shorter and sound good. There is some in game music that I quite enjoyed, but I didn’t hear that many different tunes so there isn’t much variety. 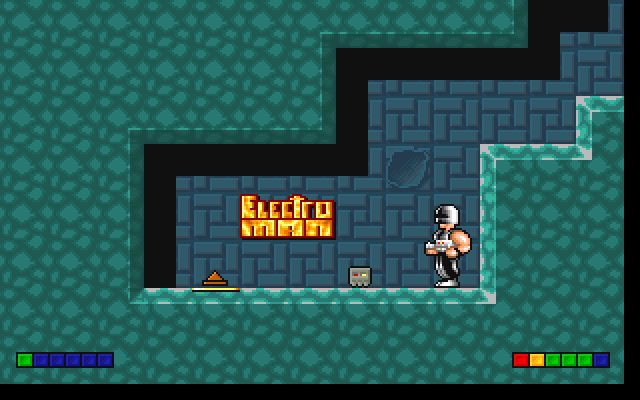 Whilst Electro Man isn’t fast-paced, there is certainly quite a bit of difficulty in the game. The first thing I noticed is that everything kills you in one hit. This is very punishing of any kind of mistake as it sends you back to the last checkpoint that you have visited. Visiting the checkpoints takes away all the energy for you weapon, so you would be wise to not pick up all the nearby energy. Fortunately there is no lives count which means you can die as many times as you need, and believe me you’ll die. I did get a little frustrated going back to the same checkpoint and replaying the same parts of the level so many times before I found another checkpoint. Fortunately whilst you lose you weapon upon death, you don’t lose any collected computer chips. 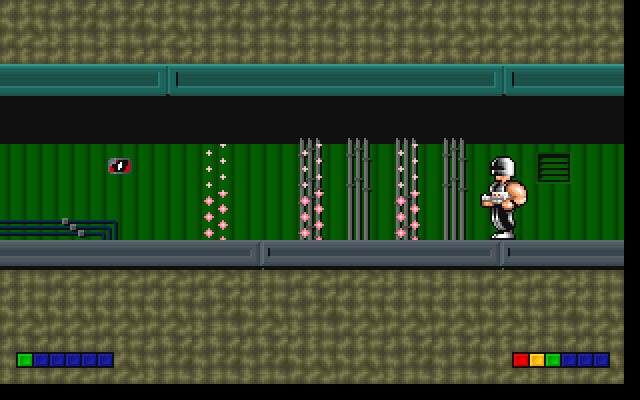 All the basic element of the game are fairly simple, but arranged the way they are make for some devious traps. It took me quite some time, about 2-3 hours just to complete the first level! 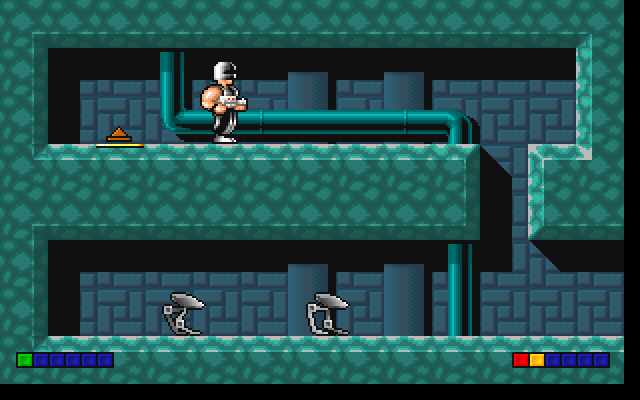 Something that made the game harder was the way jumping works. Basically you can’t change your direction or speed of movement once you’ve left the ground. This means if you need to jump to a narrow platform you have to start your jump from precisely the right spot. 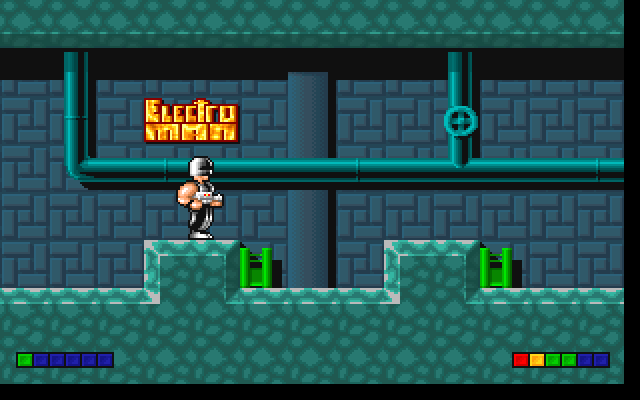 I’ve quite enjoyed playing Electro Man despite the frustrations with repetition. Once I got used to the games jumping mechanic moving around was easy but still challenging, and the enemies and traps whilst individually easy to overcome were more challenging when encountered in groups. The downside of the game is the time investment required for any progress beyond the first few levels. Fortunately you can save mid-level, returning to your the last checkpoint you visited when loading, and if things are really a pain you could use the cheat codes provided in the readme file.